There are a handful of island resorts that you can visit while bareboating in the Whitsundays. Visiting a resort can be a wonderful way to break up a holiday of a week or longer. You can swim in a pool, order a cocktail, and have a restaurant meal. It only costs a small berthing fee to visit an island or mainland resort and use the facilities for a day. Most of these offer moorings for visitor use. When visiting Hamilton Island, you have to park the boat against the marina dock yourselves as our team are not on the island to assist you. 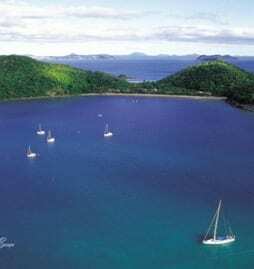 Hamilton Island will provide you with a relatively easy side-on berth, and can send a dockhand to catch your lines and help you tie up to the dock. Hamilton Island has the only supermarket and bottleshop on the islands if you run low on supplies. You can also top up your water tanks, refuel if necessary, and dispose of rubbish. It is best to contact resorts personally to arrange berths/moorings (see details below). If you are unable to contact the resort, call Whitsunday Escape and we can make a booking on your behalf. During quiet seasons, berths or moorings can often be arranged on the day over the boat’s radio. During peak seasons it is advisable to contact island resorts as early as possible to arrange visits as space is limited. The Whitsundays are mostly National Park and there are very few restaurants to dine at. Bareboating in the Whitsundays requires you to be largely self-sufficient and stocked with supplies for the duration of your charter. Facilities Fuel, showers, dive tank refills, groceries, rubbish disposal, swimming pools, nightclub, pub, restaurants, laundry, etc. Cost $130- $150 /night. Day fees $20 /hour (generally limited to 2 hours). Anchorages 301 marina berths for vessels up to 60m in length. How to Book Overnight marina bookings are necessary, book well in advance for school holidays and other peak periods incl HI Race Week in August. Call by phone 07 4946 8353 or contact Whitsunday Escape. Day visits can normally be arranged on short notice on the day by radio. Facilities Pool, bar, tennis court, BBQ, kayaks, guest kitchen, lounge and dining area, games and books. Access to National Park walks. Drinks are available from the bar and small convenience store. Cost $100 per mooring for 2 pax, each extra person is $15 p/night. $50 berthing only – no resort access. Anchorages Inner moorings available for monohulls and two outer moorings available for catamarans. Inner moorings are accessed over 1.2m bar at low tide to anchorage of 1.8m at lowest tide on moorings. How to Book Pick up an outer mooring and go ashore with tender and ask for the caretaker at reception. Facilities Saltwater pool, restaurant, showers. Anchorages 20+ moorings available. Approved overnight anchorage. How to Book Call prior to arrival for further information. Tender ashore to use amenities. Facilities Island bushwalks still accessible. Anchorages Approved overnight anchorage – do not use moorings. Disclaimer: Prices listed are an indication only and were correct at the time of publishing, but are subject to change by the resorts at any time. Please check fees when making your enquiry.